This online catalog can help you quickly locate and save details about undergraduate and graduate programs. Whether you are a prospective student or already enrolled, you can easily see what the University of Saint Joseph has to offer. 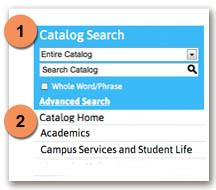 If you are new to our online catalog and would like to learn more, click the box at the top right of any page. The University of Saint Joseph has reserved the right to add, amend, or repeal any of its regulations and rules in whole or in part, at such times as it may choose. Nor shall this document be construed as an abridgment or limitation of any rights, powers, or privileges of the Board of Trustees.